Southgate residents have expressed ‘deep concern’ at a poorly lit path used to cross the railway line. In order to access the footbridge west of Crawley Railway Station, residents have to use a footpath off East Park. Michael Jones, a Labour county councillor for Southgate and Crawley Central, has written to Bob Lanzer, cabinet member for highways and transport, to pass on residents’ ‘deep concern about the existing state of lighting’. 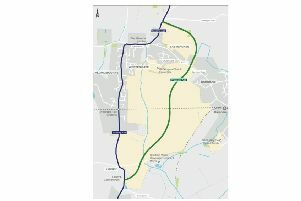 But a spokesman for West Sussex County Council confirmed it was working with its contractor on plans to install some lighting in the area, which would be subject to consultation to residents ‘in due course’. He described how insufficient light was not only leaving some users of the path feeling vulnerable, but was also potentially dangerous for elderly residents stepping off the footbridge. Mr Jones described the route as popular for pedestrians travelling to and from the town centre as an alternative to the level crossing.